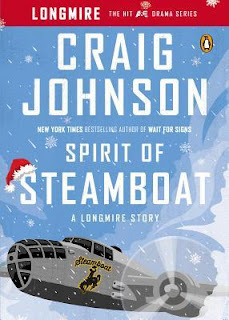 Spirit of Steamboat (Longmire Mysteries #9.1) by Craig Johnson is available at Amazon, Barnes and Noble, and BooksAMillion. Sheriff Walt Longmire is in his office reading A Christmas Carol when he is interrupted by a ghost of Christmas past: a young woman with a hairline scar and more than a few questions about his predecessor, Lucian Connally. With his daughter Cady and undersherrif Moretti otherwise engaged, Walt’s on his own this Christmas Eve, so he agrees to help her. At the Durant Home for Assisted Living, Lucian is several tumblers into his Pappy Van Winkle’s and swears he’s never clapped eyes on the woman before. Disappointed, she whispers "Steamboat" and begins a story that takes them all back to Christmas Eve 1988—a story that will thrill and delight the bestselling series’ devoted fans. Walt Longmire and Lucian Connally are visited from the ghost of Christmas-past in this holiday-themed novella. I'm not a huge fan of Christmas-inspired reads, it's not my winter holiday of choice, so I tend to skirt around holiday-themed books unless the book is part of a series like this one. In this book, Christmas gives us the time with Charles Dickens' A Christmas Carol being the reoccurring Christmas reference. A Christmas Carol is one of the holiday-themed reads that I enjoy so no issues there. What this book doesn't do is thrust cheap decorations or annoying music at me; there's no wading through fake holiday cheer with this book, though readers are treated to the feel-good ending that's a norm for holiday-reads.